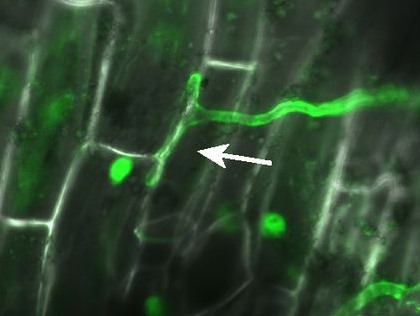 The ability of root cells to distinguish mutualistic microbes from pathogens is crucial for plants that allow symbiotic microorganisms to infect and colonize their internal root tissues. Here we show that Lotus japonicus and Medicago truncatula possess very similar LysM pattern-recognition receptors, LjLYS6/MtLYK9 and MtLYR4, enabling root cells to separate the perception of chitin oligomeric microbe-associated molecular patterns from the perception of lipochitin oligosaccharide by the LjNFR1/MtLYK3 and LjNFR5/MtNFP receptors triggering symbiosis. Inactivation of chitin-receptor genes in Ljlys6, Mtlyk9, and Mtlyr4 mutants eliminates early reactive oxygen species responses and induction of defense-response genes in roots. Ljlys6, Mtlyk9, and Mtlyr4 mutants were also more susceptible to fungal and bacterial pathogens, while infection and colonization by rhizobia and arbuscular mycorrhizal fungi was maintained. Biochemical binding studies with purified LjLYS6 ectodomains further showed that at least six GlcNAc moieties (CO6) are required for optimal binding efficiency. The 2.3-Å crystal structure of the LjLYS6 ectodomain reveals three LysM βααβ motifs similar to other LysM proteins and a conserved chitin-binding site. These results show that distinct receptor sets in legume roots respond to chitin and lipochitin oligosaccharides found in the heterogeneous mixture of chitinaceous compounds originating from soil microbes. This establishes a foundation for genetic and biochemical dissection of the perception and the downstream responses separating defense from symbiosis in the roots of the 80–90% of land plants able to develop rhizobial and/or mycorrhizal endosymbiosis.